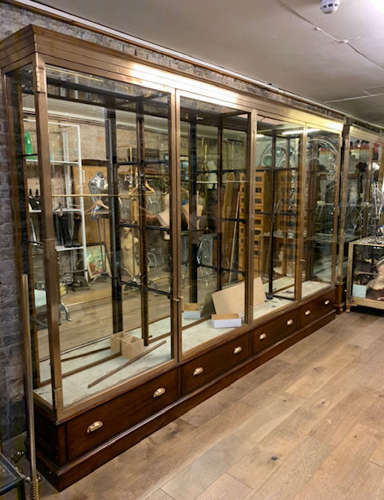 We are proud to be able to offer these wonderful bronze cabinets originating from the Victoria and Albert museum.We were lucky to buy them via Damien Hurst. The quality is ,as one would expect from the V and A “simply the best”. We have three 2 doors cabinets and five 4 door cabinets - this is the four door version. They each have 3 adjustable glass shelves, and are finished with a mahogany trim, standing on a mahogany base.The bronze is a fabulous Deep colour. The back is not currently mirrored, but can be if required - see the two door version for this. This is a once in a life time opportunity to purchase cabinets of this quality and we are selling them on a first come first served basis.